For mega-wealthy young men of the Gulf Arab states nothing says 'I am rich' more aptly than to Instagram yourself and your lion or cheetah posing alongside your Mercedes or Lamborghini or motoring along in a speedboat. 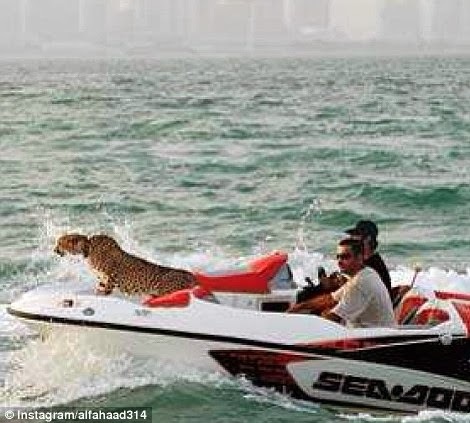 Showing off the Persian Gulf's latest 'ultimate status symbol', the penchant for posting big cat photos on Instagram betrays the young men's sheer bravado or stupidity, depending on your point of view. 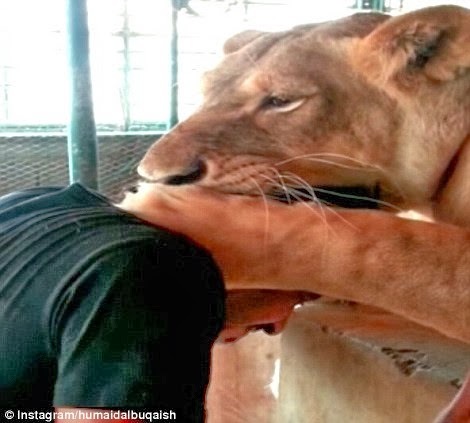 Indeed, while the intimacy on display the owners seem to share with their cats is clearly touching, others could possibly think of better ways to flaunt their wealth than sharing feeding time or bathing with fully grown 400 pound lions. 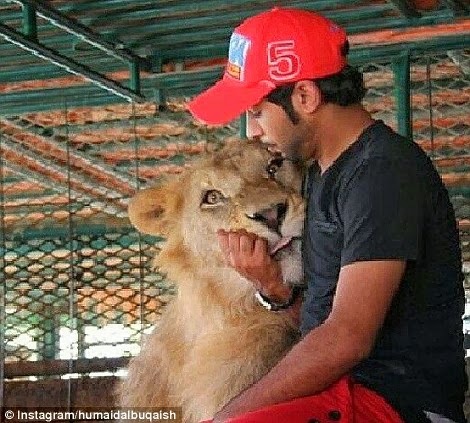 Eagerly followed by over 250,000 followers on the popular photo-sharing website, Humaid AlBuQaish, has become cult viewing as he regularly posts himself and his big cats online. While it is not entirely clear what AlBuQaish does for a living or how he accumulated his fabulous wealth and pets, it is clear that he lives a life of luxury that most can only dream of. 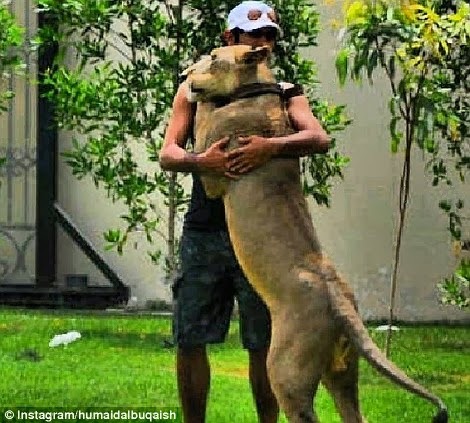 Trusting his cats implicitly, AlBuQaish is pictured feeding his menagerie of lethal predators and wrestling with them - all the while showing off the fact that he owns such magnificent creatures. 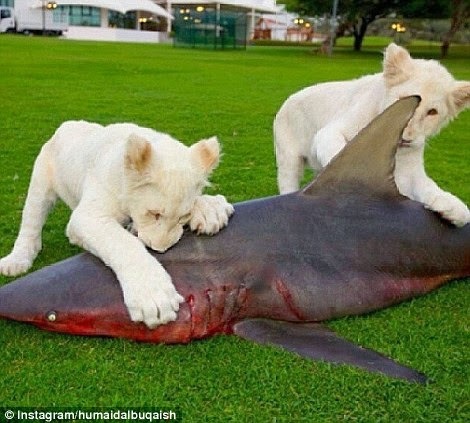 Engaging in one-upmanship online, others have posted pictures of their big cats being taken for a spin in a speedboat - while others are happy to place their heads into their prized possession's mouth. 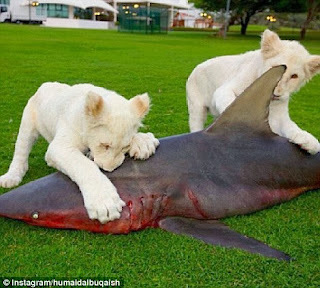 The trade in big cats in the Gulf reflects how status among the wealthy is all important, where a rare white lion will sell for around $50,000. 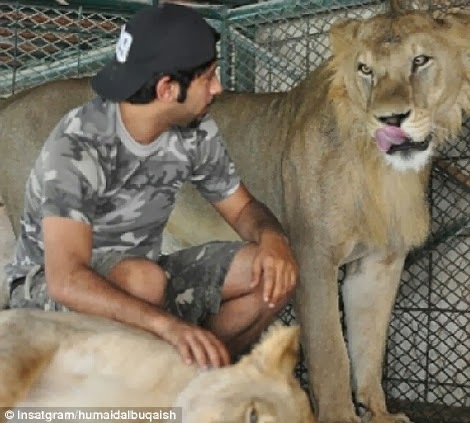 Jasim Ali runs the Ras Al Khaimah Wildlife Park in the United Arab Emirates and he adopts and cares for those animals that are discarded once they become too large and dangerous for their boastful owners. Of course there is nothing to suggest that any of those in these pictures would openly flaunt ownership of illegal animals so publicly online. 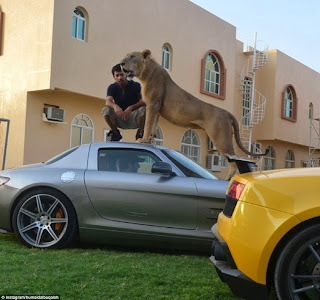 However, the problem is such that in 2010 over 200 illegal animals were confiscated in the United Arab Emirates in 2010. Among the animals taken into custody are white lions, tigers, panthers and cheetahs as well as hyenas. What do you guys think? As for me, this is serious rough play o. Ordinary dog i dey run, na Lion and Cheetah i go near. Mba!! I think not. 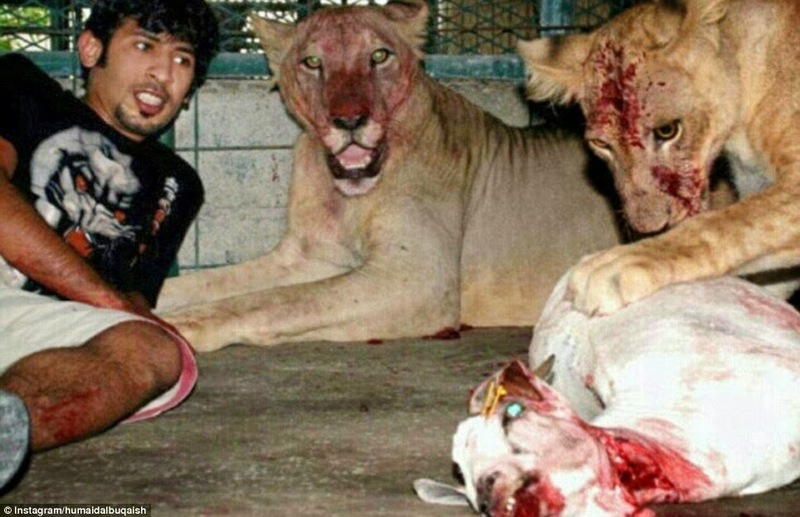 The day the animals would remember who they are, Only God would help them. Me i pass o, i no want. Sheer stupidity. They don't know no matter how you tame a wild animal, it can never be completely tamed? Hyena? That animal that stinks? Man that's gangstar! Don't mind them. Even staying when they are eating. Me that they said i should touch Lion cub in SA, i took 5 pictures and ran out of the cage. 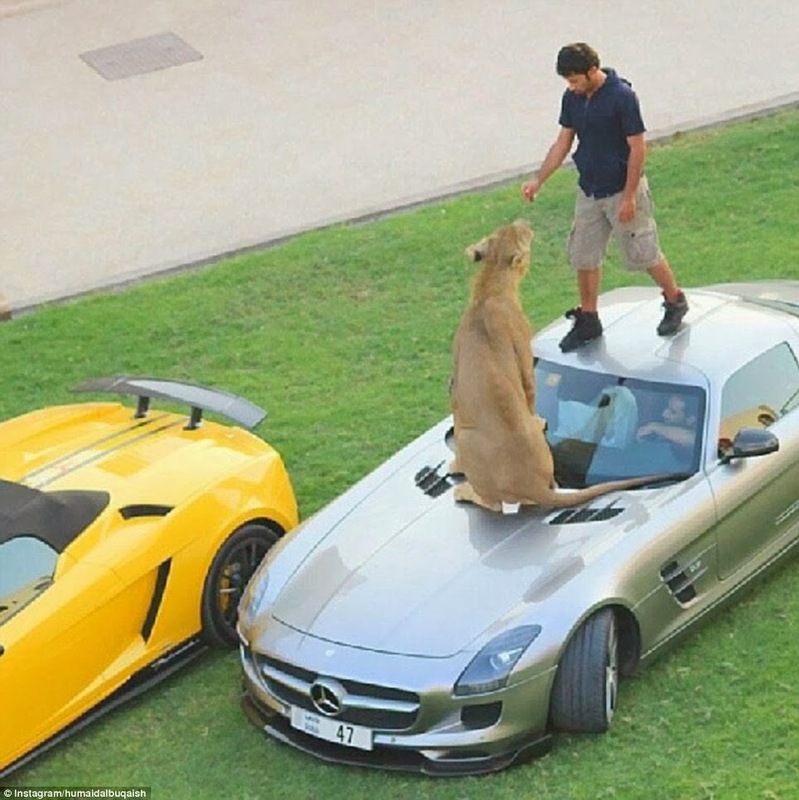 I no dey play that kind of play even if na baby and some people are playing with grown large cats. Lmao. My first visit to the zoo, na from afar I dey admire oh! BLACKBERRY IS LOOKING FOR MY TROUBLE O!! MY PRESENTATION AND WORLD DIABETES DAY…..